Over 41 million kids, between the ages of 5-14, will go trick-or- treating this year. Halloween candy sales should top $2.1 billion. About 16% of Americans dress up their pets. The most popular pet costumes are a pumpkin, hot dog, bumble bee, lion and the devil. Nearly 35 million pounds of candy corn is produced each year. It is made of sugar, carnauba wax and water. Fondant and marshmallows are also added for a soft bite. Costume sales should reach $3.1 billion this year. Of that amount, about $1.2 billion will be spent on adult costumes. The Haunted Cave, in Lewisburg, Ohio, tops the list as the largest haunted house of them all. It is 80 feet below ground, measures 3,564 feet long, and has 30,000 live bats! Don’t bring Silly String to Hollywood or you may get a $1,000 fine! It was banned in 2004. The city of Belleville, Illinois, prohibits kids over the age of 12 to go trick-or-treating. Meridian, , Bishopville, S.C., Boonsboro, Md., and several cities in Virginia, have similar laws. 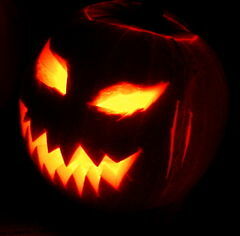 Halloween greeting card sales should top $390 million. Millennials love Halloween. About 70% will dress up in a costume, and about 48% will throw or attend a party. Because the movie Halloween was on such a tight budget, they had to buy the cheapest mask they could find for the character, Michael Myers. It was a William Shatner Star Trek mask. Initially, Shatner didn’t know the mask was in his likeness, but when he found out years later, he said he was honored.